The journals from 1854 to 1861 show the ripeness of Emerson's thought overshadowed by the gravest problem of his time--slavery. 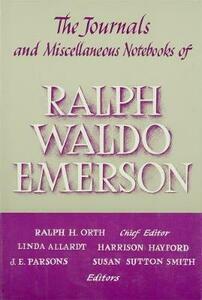 In addition to completing English Traits (1856) and Conduct of Life (1860), Emerson wrote many of the lectures and articles that made up his next book, Society and Solitude. He also contributed often to The Atlantic Monthly after helping to found that magazine in 1857. Throughout these years he extended his strenuous trips as a lyceum lecturer, crossing and recrossing the frozen Mississippi several times each winter. In Concord, he continued his omnivorous reading, his beloved walks, and his friendships with Alcott, Channing, and Thoreau, but at home or away he saw America's future darkening daily. 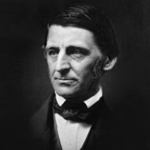 In 1856, Emerson wrote to his brother William, "But what times are these, & how they make our studies impertinent, & even ourselves the same! I am looking into the map to see where I shall go with my children when Boston & Massachusetts surrender to the slave-trade." Influenced by events such as the murder of New England men in bloody Kansas and the assault on Charles Sumner in the U.S. Congress in 1856, by a growing friendship with Theodore Parker, and by John Brown's visits to Concord in 1857 and 1859, Emerson became one of the most notable speakers against slavery. He armed himself for his emergence from the study by marshalling his thoughts on liberty as he would have ranged his thoughts on any other topic. Notebook WO Liberty, rediscovered in the Library of Congress in 1964, collects his ideas on slavery and human liberty. Probably begun in 1854 it contains drafts or records of seven antislavery speeches, including his major antislavery address, "American Slavery," first given in January, 1855. These notebooks and journals bring the philosopher of "the infinitude of the private man" to January 1861 and the brink of war.